The square quarter section site of Disneyland, with outlying parcels on three sides shown dotted. 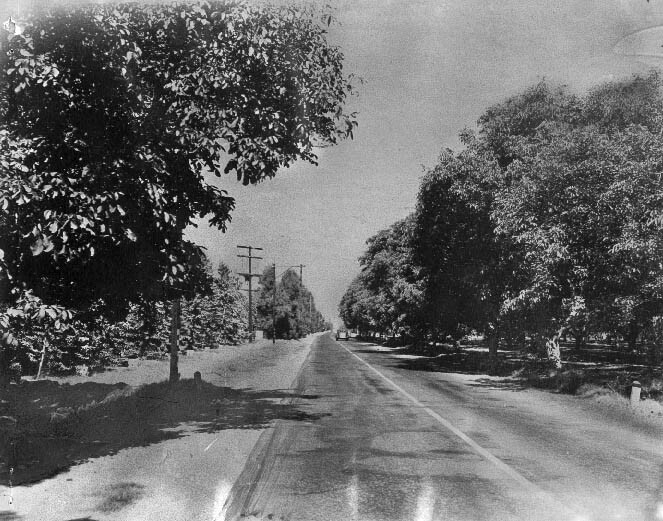 Diagonal road at top is Manchester Avenue, which became the Santa Ana Freeway. 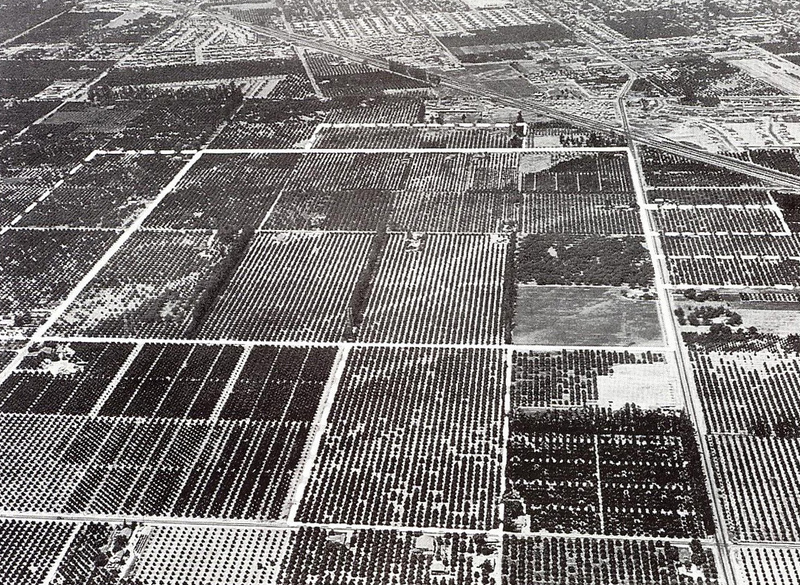 Orange County was once aptly named, but by the early 1950s, agriculture was out, suburban sprawl was in. The various cities—Fullerton, Whittier, Anaheim—were racing each other to annex unincorporated county lands before they became part of the next town over. The story of the Disneyland parcel really begins in the office of Anaheim Chief Administrative Officer Keith Alger Murdoch, just 35. He was focused on Anaheim's expansion and on attracting tax-paying industries to his city. Residential tracts paid peanuts in property taxes and cost a city in terms of utilities, schools, fire and police protection, and increased traffic, so his focus was on commerce and industry. "We looked at Disney as another industrial opportunity," Murdoch said years later. Orange trees were heaped into piles and burned on site. Murdoch knew Disney was looking for a hundred acres near the proposed freeway. His conspirators were Disney's business agent, Nat Winecoff, and Anaheim-booster Earnest Moeller, the secretary of the Chamber of Commerce. 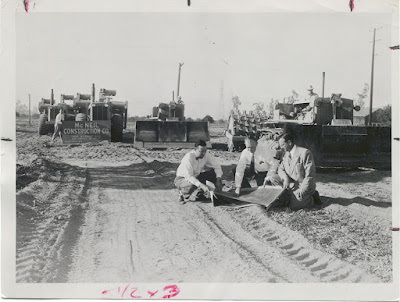 I can't prove it, but I think these three had steered the Stanford Research Institute site selection study toward a parcel southwest of Anaheim where Ball Road would cross the new freeway. That deal fell through, and that's another story, but months later it was Murdoch who realized that if Disney bought both sides of Cerritos Avenue, Murdoch could help them "condemn" the street (the government-ese for when a street is decommissioned). Orange County was laid out using the US Public Land Survey System as a grid of sections with streets following the lines running north-south or east-west. In this system, a section is a square mile containing 640 acres (260 hectares). A township is 6 x 6 sections. What Disney wanted, then, was a quarter section—160 acres (65 hectares) and about a half mile (804 meters) on a side. The way it was done is Earne Moeller recommended two local realtors, Frank Miller and Ed Wagner. Keeping Disney's name out of it, these men got 17 signatures on contracts that gave them the option of buying the property at a price certain for a given time, in exchange for a little money. If anyone had refused to sell, Disney wouldn't have to buy anything. Harbor Blvd. near Cerritos Avenue in the 1940s. Aldolph Callens of Belgium came to Orange County and married Alice Vanderbeke in 1916. They had five children on their 40-acre ranch, but Alice was widowed in 1931 and raised the children—the eldest was 13—on her own. By the time Disney wanted her property, it was owned by her children Gerard, Agnes, Anita, Andrea, and Angela. Gerard and his wife built a home on a portion of the ranch and the others stayed in the area, except for Agnes, whose husband served in the Air Force in Alaska, and Anita, who lived in Tiffin, Ohio (home of Heidelberg College, on the Sandusky River, 45 minutes southwest of Cedar Point). The not-yet-a-state Alaska and remote Ohio aspects were a big deal. In 1954, signed documents could only be transmitted by air mail—there were no fax machines. A quarter section cost about $384,000 in 1953, but Orange County was hot and prices were rising. 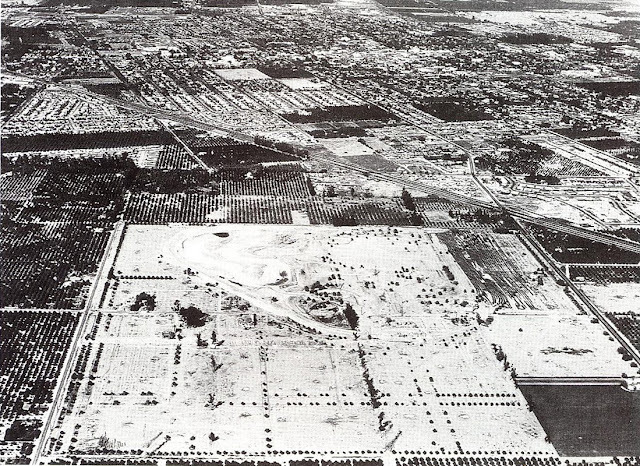 Miller and Wagner delivered the land for about $640,000 in April 1954 and Disney bought orange ranches across the street from their quarter section on three sides, investing nearly a million dollars in land in total. Because OC was booming, Disney would have made a profit even if Disneyland had not been built. In addition to the Callens' 40-acres, there were three 20-acre parcels, four 10-acre, and four 5-acre farms in the quarter section. The Witherill's property on Harbor Blvd. was bare and the Reed's ten acres were planted to walnuts, but all the rest were groves of Valencia orange trees—12,600 of them. 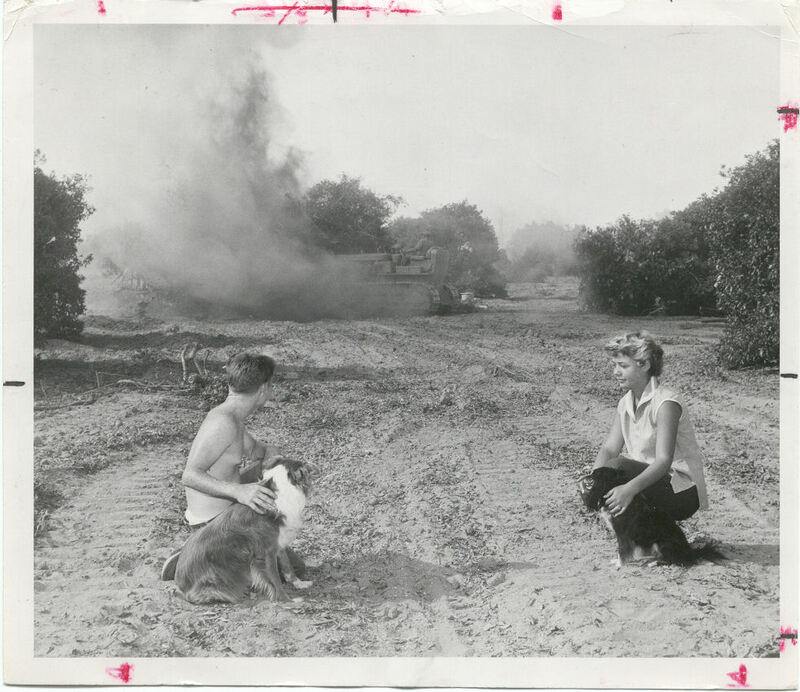 Gerhard Claussen, who owned the 20 acres under the buildings of Tomorrowland, needed an arrangement to allow his daughter to continue living on the property through 1954. Vic and Irma Peltzer, owners of 20 acres at the northwest corner of the quarter section, held out for more money. They reportedly received $5,000 per acre, when the average was $4,000. Their son, Chuck, went to work at the park and rose to become an executive. 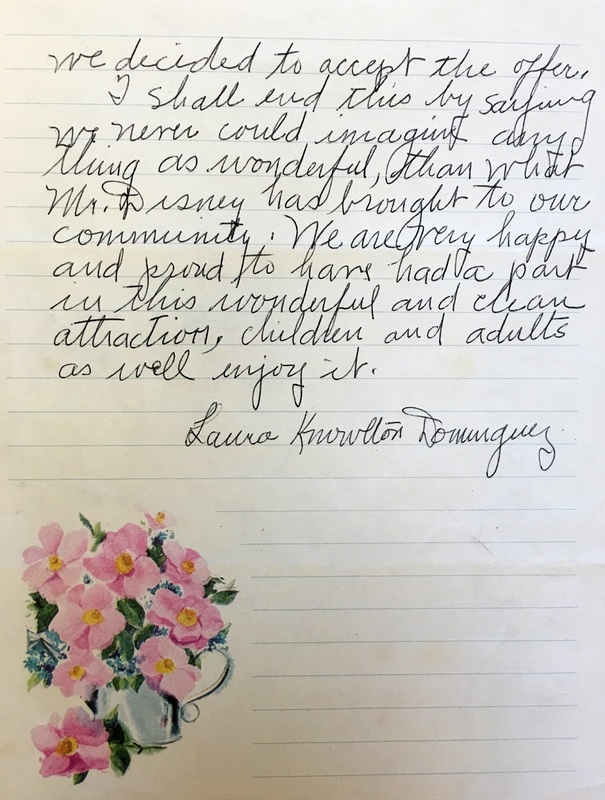 Perhaps the most famous landowner, however, was Laura Knowlton Dominguez, 56, who was born, married, and raised her two boys on a ten-acre ranch under Adventureland. She was willing to sell her oranges, but not the acre around her home. She was prepared to live surrounded by a housing tract, a Ford plant, or the parking lot of a shopping center. Her friend, realtor Frank Miller, may have whispered the name of the real buyer to her. We can imagine her wonder: Elon Musk wants to buy your house so that he can drill to the center of the Earth. Like that. Laura's younger son, Ron, signed up to work the opening summer and stayed to become Executive Vice President and honorary Mayor of Disneyland. 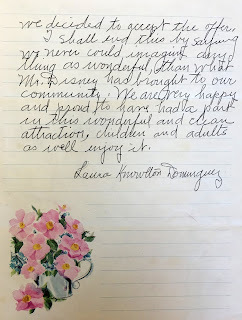 Mrs. Dominguez wrote a brief note that ended: "We had no thought of ever selling the property where I was born. This property had been in the family sixty years. But when Mr. Disney came...we decided to accept [his] offer. I shall end this by saying we never could imagine any thing as wonderful, than what Mr. Disney has brought to our community. We are very happy and proud to have had a part in this wonderful and clean attraction. Children and adults as well enjoy it." October 1954: After tree-cleaning and preliminary grading, building can begin.